The Merchants Bank opened its first Brandon office in l882, shortly after the townsite was chosen. This building, designed by the Montreal architectural firm of Taylor, Hogel and Davis, was constructed in l907. A fine example of the Beaux-Arts Classical style of architecture, the Ionic columns and decorative wrought ironwork enhance its stately appearance. 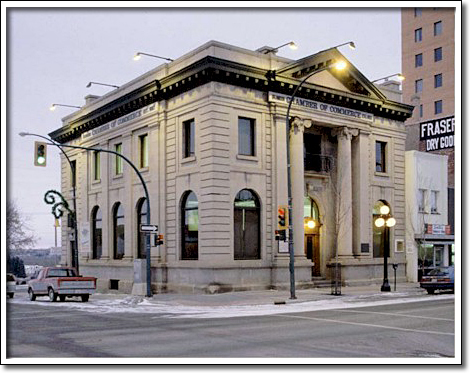 The Merchants Bank was absorbed by the Bank of Montreal in l922. The building was donated to the City of Brandon and served as the first public library from l944–83. The city gave the structure to the Brandon Chamber of Commerce and, following major renovations, it officially reopened in l986. The renewal of this graceful structure maintains the distinctive character of the Brandon business district and ensures that the important building boom of the first decade of the twentieth century will be remembered.